Additional Marketing Opportunities Special Pricing Available Only to International Cement Seminar Exhibitors SPRING 2017 Innovation in Action: 20 Ideas for Plant Productivity and Profitability Plus: Using Natural Gas as a Power Source • Lock Down Your Cyber Security • PCA Update 2020 North American CEMENT DIRECTORY INCLUDES NORTH AMERICA, MEXICO, THE CARIBBEAN, AND CENTRAL AMERICA $195.00 Cement Americas Jumpstart your North American marketing plan with discounted full page advertising in Cement Americas. 2020 North American Cement Directory A smart annual investment that reaches every import- ant cement facility in the United States. The Return of the Premier Conference and Exhibition for Cement Equipment and Technology It's back! Re-launched by SEMCO Publishing, the publishers of Rock Products, Concrete Products, Cement Americas and the North American Cement Directory, the International Cement Seminar— which previously ran for more than 35 years—returns to bring focus to the equipment and technol- ogy that is driving productivity and profitability. 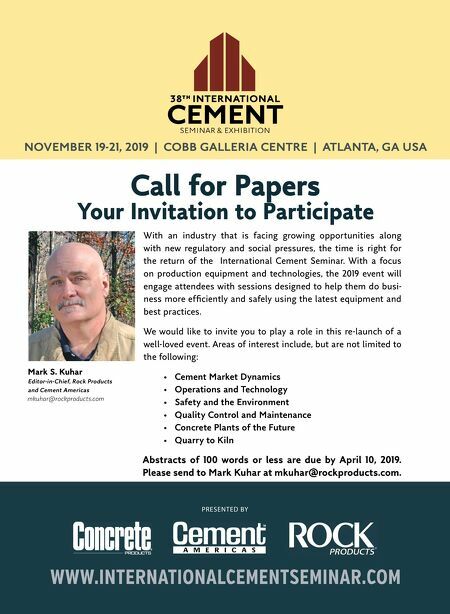 As the market for cement production continues to grow and evolve, the long-requested return of the International Cement Seminar will help industry professionals strategically plan for the future. 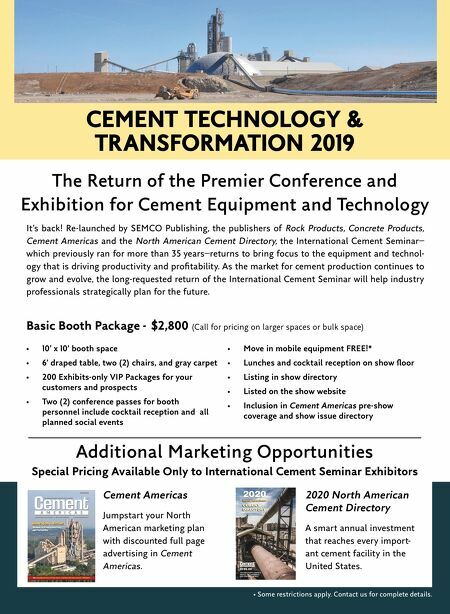 CEMENT TECHNOLOGY & TRANSFORMATION 2019 Basic Booth Package - $2,800 (Call for pricing on larger spaces or bulk space) • 10' x 10' booth space • 6' draped table, two (2) chairs, and gray carpet • 200 Exhibits-only VIP Packages for your customers and prospects • Two (2) conference passes for booth personnel include cocktail reception and all planned social events • Move in mobile equipment FREE! * • Lunches and cocktail reception on show floor • Listing in show directory • Listed on the show website • Inclusion in Cement Americas pre-show coverage and show issue directory • Some restrictions apply. Contact us for complete details.